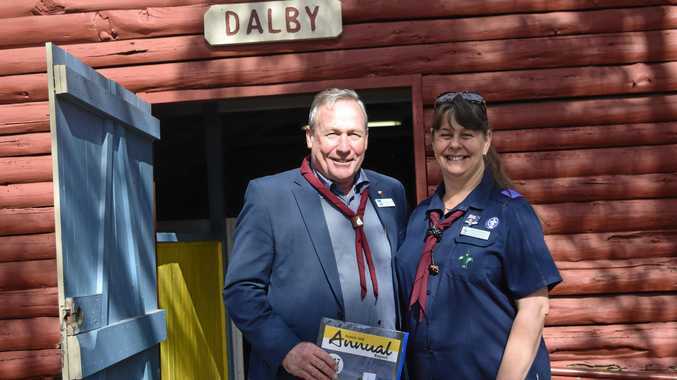 SCOUTS Dalby may have a new king of the kids, with a well known face joining their ranks in a ceremony last Friday. Western Downs Mayor Paul McVeigh received a supporter of scouts scarf, which is an acknowledgement he is appreciative of the work the group do with the community's youth. Assistant region commissioner for group support for the Beauaraba District Benita Neilson said she hoped Cr McVeigh became involved in the club. "It's great to have him wanting to support scouts,” Ms Neilson said. "It's a great occupation for youth members to be involved with the community. Cr McVeigh was intrigued with the scarf and was inquisitive about when and where he should wear it. Cr McVeigh was presented the scarf by Ms Neilson and district commissioner for the Beauaraba District Fraser Kleinschmidt. The Dalby Scouts clubhouse is located on Beck St.